RECIPE: Just in time | Cinco de Paulo! 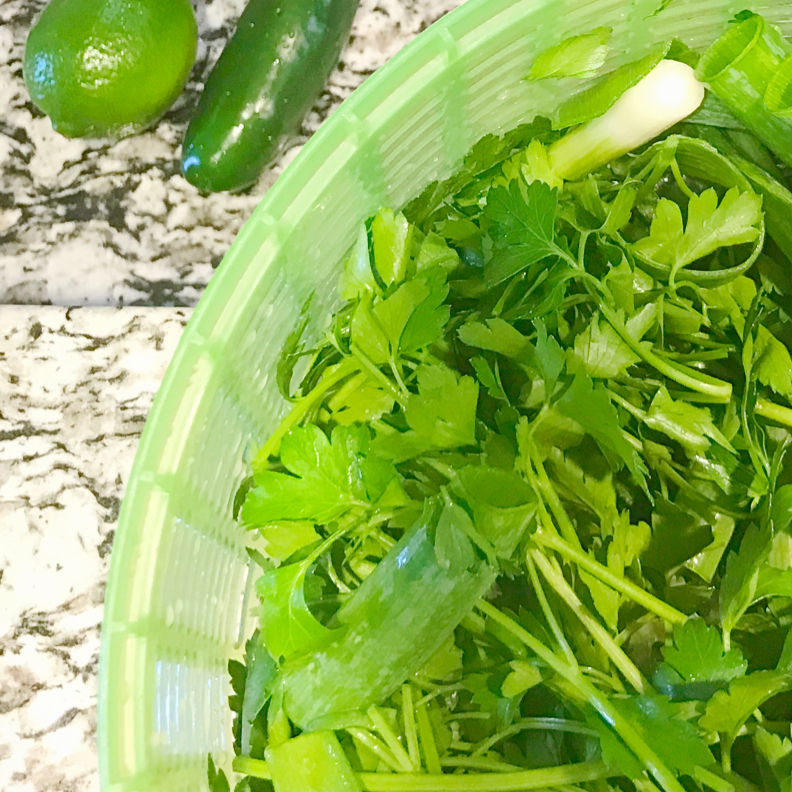 This marinade was inspired by the freshness of everything GREEN! Well, that and MAY 5th, Cinco De Mayo...which is the perfect time of year to start up the grill... This is a perfectly balanced marinade for chicken or one of my favorite marinated and grilled meats, Skirt Steak. Once the skirt steaks is grilled, sliced thinly across the grain and make tacos! So simple to make...for the most part, rough chop everything and toss into blender or food processor...ready to go. I made this with my sister Sue at her home in Florida over the winter while visiting. We used it with chicken and those breasts were so juicy and flavorful with the perfect char...of course we doubled the recipe so there was plenty to use for dinner one night and she and her hubby got all creative and used it as a sauce over pasta another night. I hadn't even thought of that...she said it was amazing. So I encourage you to make this and get creative with how to use it...let us know in the comments! 1. Combine all ingredients in a blender or food processor and blend well. The mixture will be a beautifully fresh green color. For more heat, use the seeds or ribs of the jalapeno…adjust to your liking. Use more olive oil if needed to adjust viscosity…depending on the amount of the herbs it may take more liquid to blend properly. 2. Pour marinade in a zip-lock bag and add selected protein (chicken, pork, etc). Remove excess air from bag and seal. Meat can marinate in the mixture between 2 - 4 hours. Due to the acid from the limes, it is not recommended to marinate overnight…the texture of the meat could end up mushy. If you like ceviche, you might try shrimp in this marinade, but double the lime…in which case you would want the acid to basically ‘cook’ the shrimp over time. 3. Fire up the grill or oven, cook the meat to your preference. Heat any extra marinade (to 165 degrees) for a dipping sauce or brush on meat during grilling process. Enjoy!